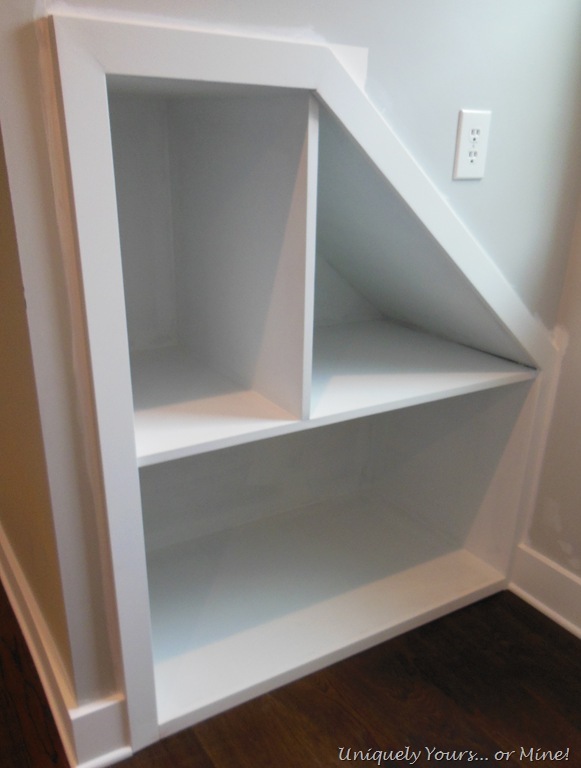 Building a Knee Wall Built-In Cubby – Uniquely Yours… or Mine! 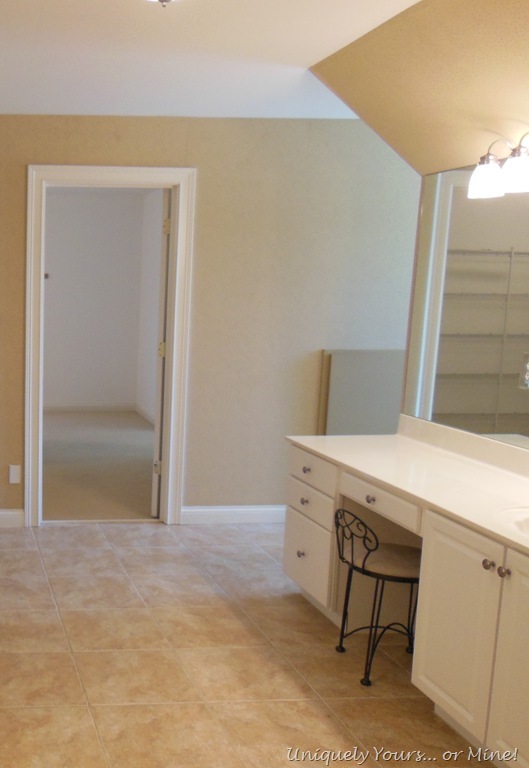 Last week I shared with you my pretty built-ins that we completed in the dormer knee wall areas, but today I want to discuss with you how we built the cubbies for these improvements. The definition a a knee wall is a short wall, typically under three feet in height, used to support the rafters in timber roof construction. In our bathroom we had a knee wall on the right hand side which was about 6’ tall as shown on the right of the picture below. 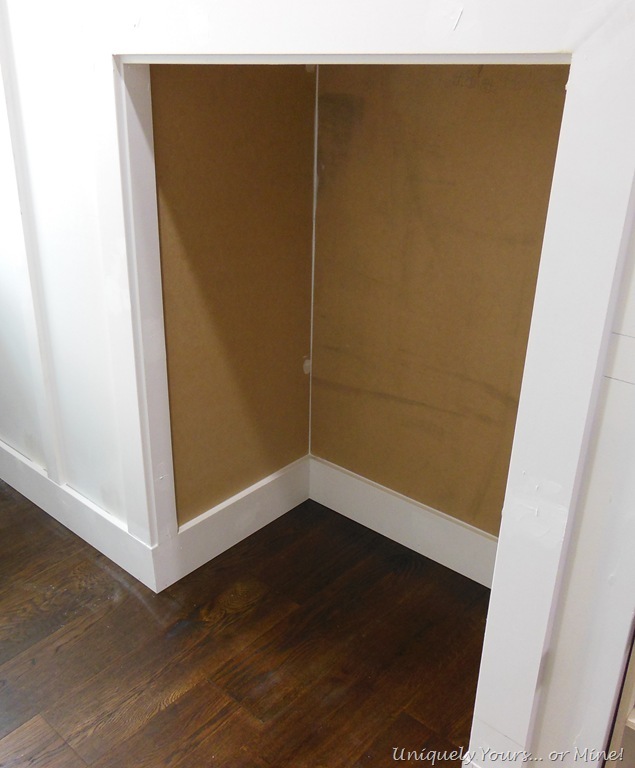 The closet knee walls were a full 8’ height. We knew that there was a ton of wasted space that we wanted to gain access to. So in the bathroom we decided to use up a portion of the space to create a nook for the laundry cart, it’s not a big deal but it’s a good use for space that would otherwise be unused. First things first we decided how big we wanted it and then cut a hole in the sheetrock. My Hubby built 2×4 walls in place to hold all of the “guts” of the cubby. The walls were attached to the floor and the ceiling rafters and built like a typical (albeit small) walls are built. Hubby thought I went a tad overboard with the insulation of these boxes, but I’d MUCH rather over insulate than under. So he wrapped the outside of the box with a radiant barrier insulation, stapling it as he went and taping the seams with foil tape. Then he installed R-13 bat insulation between the studs on the inside of the box. We then installed 1/4 plywood sheeting to the studs, securing it with nails and caulking all of the seams to prevent air leakage. Then we installed 3/4 MDF, securing it with nails to the frame and I again caulked all of the seams. 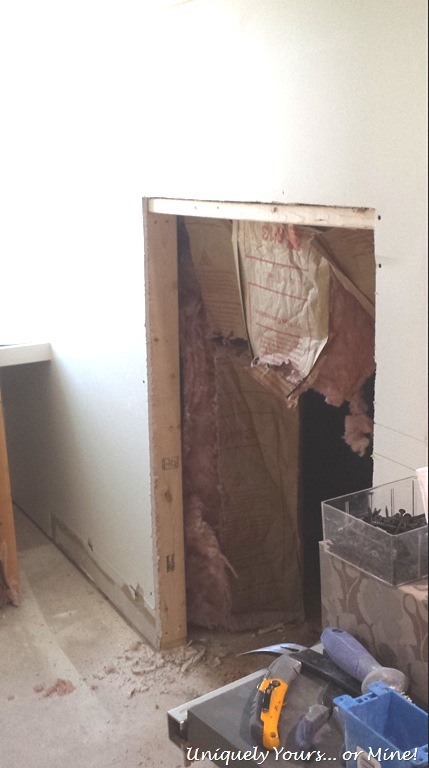 I also filled any gaps around the sheetrock on the outside frame with spray foam… look guys I was being THOROUGH! I then added the molding and trim around the inside and outside of the box, caulking and filling where necessary. 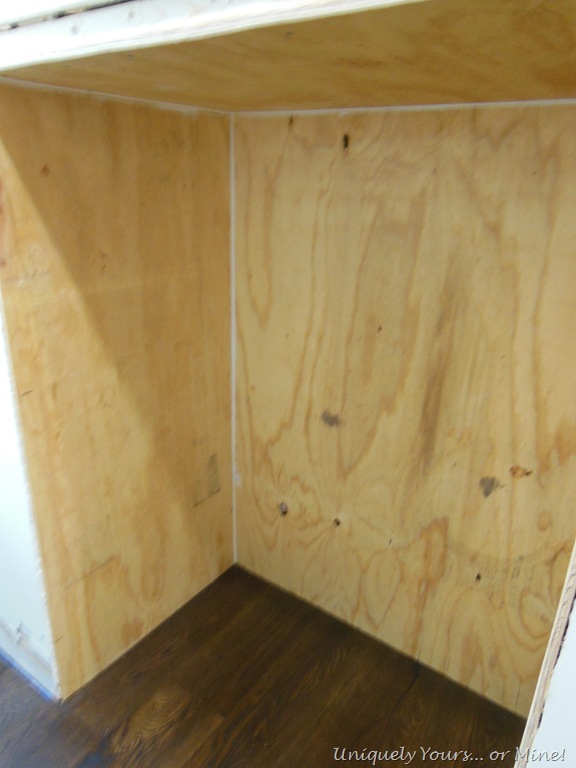 This was the end result, a perfectly insulated built-in cubby! just ready for our laundry cart! The cubby was perfectly sized, we made it a lot taller though so that I could add a shelf to the area, I’m waiting to see how I use it first before moving on to that step. 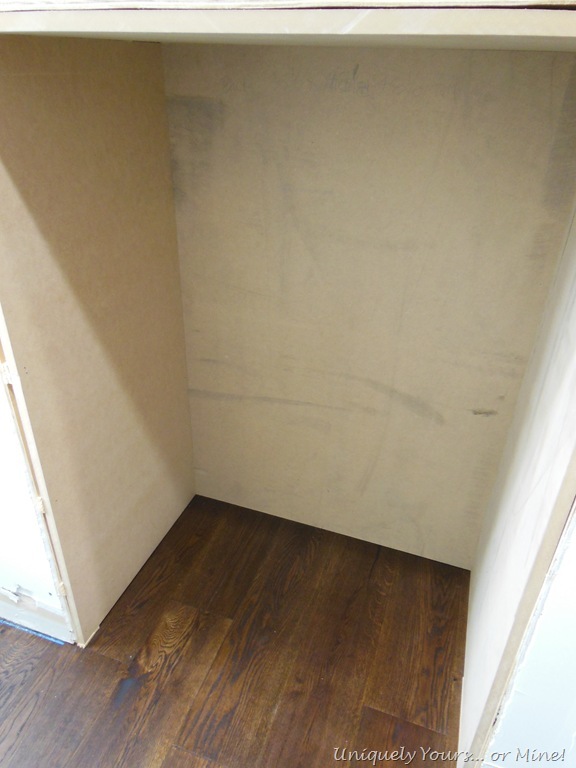 We also built 2 other boxes into the knee wall in the closet, to which we then later added pull out shelves. These boxes were built the exact same way as the one in the bathroom. 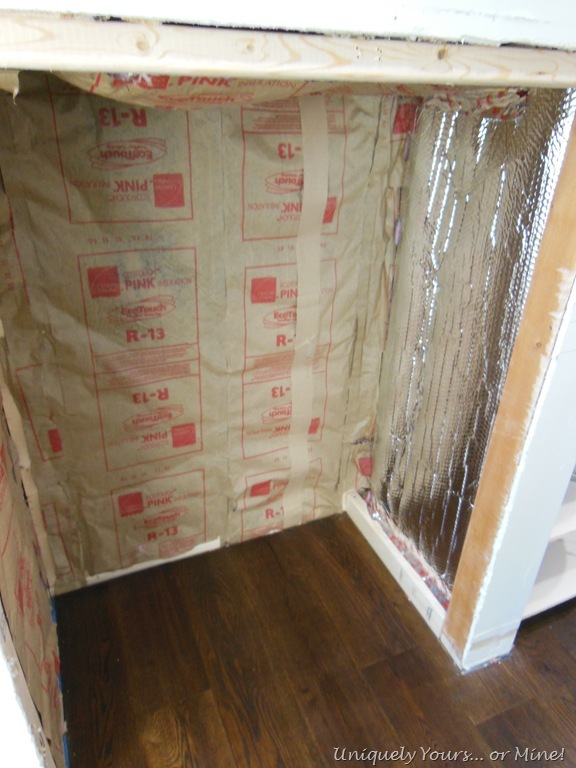 We also added a radiant barrier to the walls inside the closet knee walls while the walls were open, this extra step will also help with heating and cooling loss. I feel very confident in the insulating job we did on this project and I can’t stress enough how important it is to do so anytime you open up a wall into an un-insulated space. 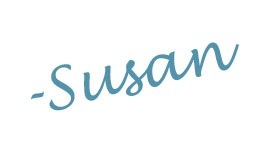 I hope you enjoyed this project! Neat – what a great idea! Thanks for sharing.